I’m looking for the original Wing Chun. I’m looking for the complete Wing Chun. This is a common goal/question I’ve encountered over the years talking to prospective students and art lovers regarding Wing Chun Kung Fu (aka Wing Chun Kuen). It’s a very reasonable question— but a question with no answer. Wing Chun has its history, just like everything else in life. To illustrate my meaning, let us start with the premise that Wing Chun Kung Fu, as taught by Yip Man is the original and complete Wing Chun. Yip Man had hundreds of students who learned Wing Chun. So who learned the original and complete Wing Chun? Let’s say for the sake of argument, the best of the best learned the original and complete Wing Chun. Does this mean they learned everything Yip Man knew? Does this mean they would do everything Yip Man would do? The answer is obviously no. Yes, they learned Wing Chun. Yes, they learned what Yip Man taught them. But it is never original or complete. The student will take the concepts and drills they learn, study, and apply them to the situations they face. They will learn from their mistakes and improve upon what they learned, and always continue learning. 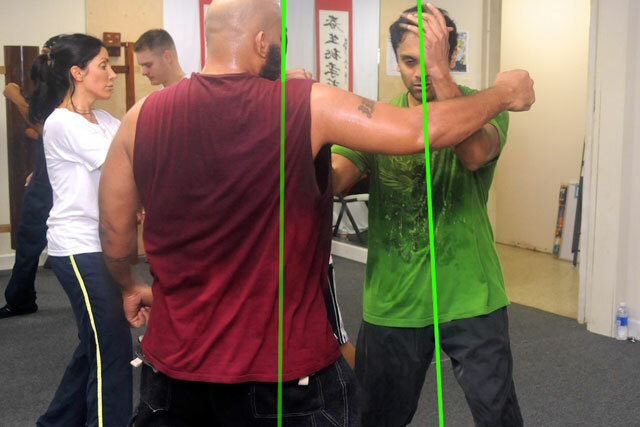 It is in this way that Wing Chun is constantly developing and evolving. Repeat and apply this to every generation and the situations they encounter, and you will quickly see that its hard to know what is the original and complete Wing Chun. For those curious to know how large the Wing Chun Pai (family) really is, read Complete Wing Chun by Robert Chu, Rene Ritchie and Y. Wu. The Yip Man side of the family is one branch of a long and broad family tree. Yes there are many great SiFus out there that come from a stellar lineage and training history. Yes there are many SiFus that are world renowned and famous in their own right. They all have my highest respect and gratitude for learning and passing on the art of Wing Chun. Yet, in regards to prospective students seeking the art of Wing Chun, my recommendation is, and will always be, to be less concerned with names and more concerned with substance. Wing Chun is an applied martial art. So the questions you should ask yourself are, “What will I learn?” and “How applicable do I think this is in what I might encounter?” Having the proper questions will keep you true to Wing Chun. Whether it was driving naked with a loaded gun down Sunset Boulevard or breaking into his neighbor’s house by accident, Robert Downey Jr. was out of control. In 1999, the actor was arrested once more and spent the better part of a year in jail. He was such a loose cannon that filmmakers who wanted to hire him were forced to take out massive insurance policies or withhold his salary to get their films made. He was fired from Ally McBeal after another drug infraction and chose to take a few years to get his life together and re-evaluate his priorities. It was during 2002-2003 that he began practicing Wing Chun, a form of kung fu which he credits for giving him the strength to overcome his addictions. Sometimes referred to as “a martial art for the mind,” Wing Chun is a powerful new (yet very old) Chinese art known to increase focus, concentration and relaxation. In 2003, Downey started working again, and released a string of well-received movies like The Singing Detective, Fur and Zodiac before landing the key role of Tony Stark in Iron Man, which was released in May of 2008 to record-shattering returns. With Iron Man, the resurgence of Robert Downey Jr. is now complete. He’s on top of the box office with a blockbuster franchise, clean and sober, and happily married. With his drug demons behind him, his legend is only beginning. Downey is now working on Iron Man II which is set to be released in 2010 as well as starring as the Victorian-era detective in the upcoming Sherlock Holmes film. The concepts and philosophies found through Wing Chun training bring about a new way of looking at life’s challenges helping you to deal with situations in whole new way – things you don’t usually find in other activities. But what is this Chinese martial art called Wing Chun? Wing Chun (Wing Tsun / Ving Tsun) is a highly effective combat-tested system of self defense, fighting skills and defensive tactics. It has been taught and integrated into the training programs of hundreds of military & law enforcement agencies around the world such as the US Navy Seals, FBI, CIA, French RAID and German SEK units. Wing Chun emphasizes aggressive tactics, direct/scientific movement and realistic training. It prepares its trainees in the subjects of self-defense, self protection, fighting and combat skills, as well as skills to defend others. A practical and scientific system, Wing Chun teaches how to prevent, deal and overcome all kinds of violence and attacks. But what really seems to have caught the attention of Robert Downey Jr. is the art’s ability to go well beyond fighting. It encompasses the full mind, body & spirit of martial arts. The concepts and philosophies found through Wing Chun training bring about a new way of looking at life’s challenges helping you to deal with situations in whole new way – things you don’t usually find in other activities. Posted in Articles -	Tagged Robert Downey Jr.